Research efforts are being expended to determine if a spray can be applied to a plant to decrease transpiration; thus reduce water use. Theoretically, transpiration can be decreased by increasing deffensive resistance to water. The resistance should be interposed between the leaf and dry air rather than between the leaf and its source of water. Most research is being conducted with material that will close the stomata or pores of the leaves of plants. Carbon dioxide, necessary for photosynthesis, is admitted through these pores that are also the exit means for water. A film that will prevent water from leaving through these pores, while being permeable to carbon dioxide, is the ideal. Therefore, stomatal closure by chemical sprays can decrease transpiration and can also decrease photosynthesis, which may reduce normal plant functions and yields. Some positive findings in using anti-transpirant chemicals have been found when used on potatoes; potato yields were increased. The material was applied with a high pressure sprayer just after tuber set. Moisture uptake was reduced and short periods of soil moisture stress that occured in the area were corrected. These findings may become important in conservation of water, especially in the arid climates. Surfactants are materials that reduce water surface tension. Claims of increased water infiltration with the addition of surfactants are made by manufacturers. Researchers have found that when used in the recommended amounts, water infiltration has not been increased. Evaporation of water from the soil surface has been reduced with a fatty alcohol and a nonionic surfactant, when mixed with the surface 3 inches of soil in laboratory experiments. Black polyethylene film covering 90% of the area reduced evaporation in a field test. The cost of these treatments on a field basis may be prohibitive. As soil dries a “dry soil mulch” or “dust mulch” usually forms naturally. Mulches of plant residues are very useful in seedling establishment, although the total difference in water content between the mulched and bare soil may be small. Residues, however, aid in increasing water intake and prevention of soil erosion. The concept of applying fertilizers, herbicides, fungicides and other chemicals via center Pivot irrigation systems is fast becoming a major cost reducing method. A sprinkler irrigation system can be an effective method of applying certain preplant and pre-emergence herbicides. Fungicides can be applied at the exact time needed. Fertilizer can be applied when needed during the fast growth period and when the most efficient use can be made. Each chemical must be used correctly to be effective and their application is being strictly controlled by government agencies. Before any application is made, the label should be carefully studied. The amount of water used in the application of chemicals is critical. Some chemicals need to be applied with low amounts of water, while others may need sufficient amounts to leach into the soil. 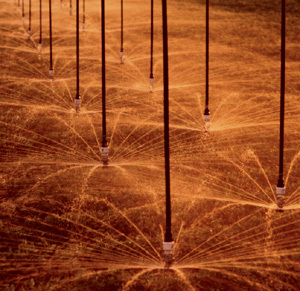 Farmers are experimenting with center-Pivots by using a plastic piping system added below the sprinkler truss so that he is able to apply chemicals without irrigating. This saves hiring someone to spray. 2 responses to "Chemicals through sprinklers"
We have some questions about the possibility of replacing all or the greatest percentage possible of fertilizer for a corn crop with fertirrigation using the Pivot. Could you give me any further information on this subject? Fertilizing with Pivots is a very common practice because it allows you to apply fertilizer with maximum uniformity and at the same it significantly reduces the costs of manual labor and machinery. All you need is the necessary pressure and fertilizer injection pump for the flow. The injection pressure always has to be greater than the pressure in the pipe where the injection is going to be made and the flow will depend on the product manufacturer’s instructions, which must instruct us on what proportions must be used to dilute the product in water and how many liters to apply per hectare.